One of the watch-world’s most prominent yet recent names is the Orient Star Automatic Power Reserve Men’s watch. The Orient Star Power Reserve Automatic watch marks the class of the craftsmen in technical excellence as well as in graceful design qualities. These, essentially create the warmth present only in a high-end, automatic watch. It has been built keeping in mind the classy, sophisticated, corporate and semi-formal business crowd used to discussing business not always within four walls and a roof. So the Star Power Reserve Automatic has been given a robust build, enough to take a swing of tennis or golf or the fun and frolic in sand and water. Affordable, elegant and functional, just don’t expect the lume brightness equivalent to Orient diving watches. This watch is not meant to be taken to underwater adventures anyway, but boardroom adventures - yes. The chief point of attraction here is the Power Reserve complication. It is an additional yet useful function that gels with simple time-telling without leaving rough edges. This new adde dimension lets you know when and how much life to put in your watch or for how long you can continue with the turns left in the mainspring currently. It offers the joy of seeing the needle going up while you wind the spring. There’s also a halt mechanism for the seconds hand; this helps to set time stop on accurate to your preferred source. The look is typicallly 1950-s and holds excellently to the theme of the shining star. Quality-conscious consumers will be sold on its simple design, bundled with timeless features. However, should you want things bit more classy, the Orient Automatic Dual Time Vintage Skeleton Limited Edition might be your ‘piece. This too carry a power-reserve and runs on a hand-wind, automatic movement. 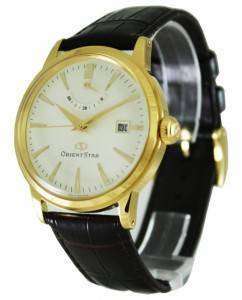 It came out last Summer (2013) and introduced the ORIENT STAR into the global market. Only 1,000 pieces were made; if there’s one you come across for sale, know you have come across a rarity you are looking at more than two decades later. It’s heavily influenced by the skeleton model MON BIJOU whose gold-colored movements have been revived into this latest edition. The premium finish brings on an exclusivity that brims further with refinement. Both of the Orient Power Reserve Automatic Men’s watches come in edgy cases, but on thin frames. The rear part of the case (case back) also gives little exhibition of the insides and you can see clearly the way the 22 Jewels Cal 40N52 Japanese automatic in-house movement runs. This is the marvel of modern, technology-aided design; they help convey both class and presence, making it an unparalleled, impeccable dress watch that is also convenient for most of the places.